(left) Louis Fan and Jade Leung, and (right) Sammo Hung in Flying Dragon, Leaping Tiger. The Skinny: Middling direction and questionable acting makes this kung-fu epic less than it could have been, but the abundance of action sequences is welcome. This is not really a good film, but it's nice that they actually made something like this. by Kozo: The title of Flying Dragon, Leaping Tiger may capitalize on Crouching Tiger, Hidden Dragon, but the film certainly doesn't. While possessing of many of the same signifiers as its internationally-renowned cousin, this film is more like the routine wuxias of the late eighties and early nineties, except without the comedy. The lack of HK-style comedy is actually welcome, especially if Wong Jing might have been employed. Then again, without the stylized excess of the Tsui Hark-produced flicks, Flying Dragon, Leaping Tiger is ultimately unaffecting and bland. The action is good, though. 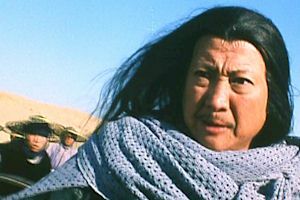 Sammo Hung stars as Luk Ching-Yang, who twenty years ago was left by wife Liu Lu-Yian (Cheng Pei-Pei). Back then, Lu-Yian and Ching-Yang's son was killed when thier old pal Kiu Hung betrayed them to the government. Luckily Ching-Yang was able to escape with her adopted daughter Liu Wan-Long, but her bitterness leaves her angry at both men. 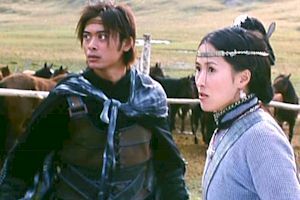 Now in the present, Lu-Yian teams up with a young warrior named Pak Suk-Fu (Louis Fan), but Kiu Hung's descendants are after her head. Meanwhile, Luk Ching-Yan is trying to make peace with all sides, but everyone wants revenge for one thing or another. The adult Liu Wan-Long (Jade Leung) joins the fray, but there's a secret which links her to Kiu Hung's family. Then everybody starts fighting. The story of Flying Dragon, Leaping Tiger isn't as convulted as some of HK's earlier wuxias, but the way in the story is told could induce snoring. Events are related in a byzantine manner, and when plot points are revealed, they seem to carry no dramatic weight. Furthermore, the acting can be egregiously annoying. Some of the characters get over-the-top mad, laugh out loud maniacally, and generally act in non-Crouching Tiger, Hidden Dragon ways. Still, despite the all-over-the-map acting, director Allen Lan's handling creates a blandness which renders everything unaffecting. There's drama in this storyline, but nothing seems to register as such. The overall feel of the film is as dry as the desert in which its set. However, there's action. The numerous action-packed sequences can entertain and even thrill despite an obvious low budget and some questionable technical prowess. The special effects, in particular, look like they were created using a Commodore 64 with only three available colors. However, most of this can be forgiven when the characters start lashing out with kicks, punches and a flurry of swordplay moves. Nothing here is new, inspired or noteworthy, but the abundance of high-kicking hijinks should strike the nostalgia nerve of most HK Cinema fans.